It is high summer and our annual summer sale, renowned for its years of valuable, lasting, bargains has finally arrived. 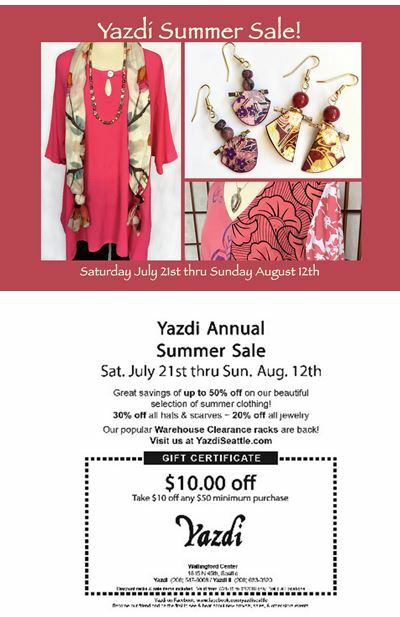 Please come join us starting Saturday, July 21st and continuing through Sunday, August 12th. You will find great savings of up to 50% off on this years remaining selection of summer clothes. All scarves and all hats are 30% off and all our lovely jewelry is reduced by 20%. Also, this summer, our exciting Warehouse Clearance Racks are back! Finally, spend $50 or more and receive $10 off on your purchase. Just ask for your one per customer coupon. Please come to our sale and be greeted with warm, welcoming service; and always free, close-in parking, or equally easy bus access. We hope to see you, happy summer!